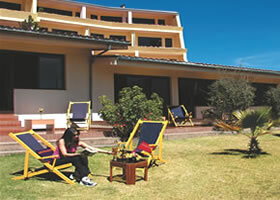 The Andino Club Hotel is located in the Pedregal district, Calle Pedro Cochachin No. 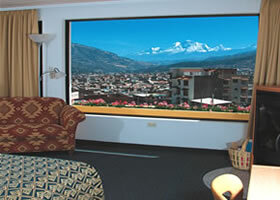 357, within walking distance of the Plaza de Armas and Cultural Center Huaraz. 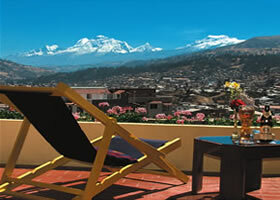 From the Andino Club Hotel, you have a wonderful panoramic view of the Cordillera Blanca and 8 peaks of 6000m. Region of rich history which formed the first basis of future cultures.Birthplace of the Chavin culture (about 1700 years BC) which would impact on other regions and later cultures. In the first millennium of this era developed or Huaylas Recuay culture that has not stopped interesting examples of pottery and stone statues. After the Inca conquered the region in mid-fifteenth century to its vast imperio.En annexing today because of its archaeological remains and its privileged geography with its glaciers and snowy peaks in excess of 6 000 m. height is one of the most important tourist centers in Peru. Banquet Hall and Convention Center. 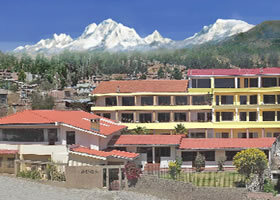 Capacity 50 to 130 people. Switzerland International and National cuisine. Fax, photocopier, Internet, Print, Mail. Conference room with capacity for 120. 2nd, 3rd floor - overlooking the White Mountains with a fireplace, sauna, jacuzzi. 4th floor, large terrace with a splendid view to the Cordillera Blanca (1 king bedroom, dining room, kitchenette, fireplace, sauna, jacuzzi). Buffet breakfast Andino. not include payment of 10% of services do not include payment of VAT for customers Peruvians and foreigners living in Peru.